Faculty Senators gather in Scott Hall to hear a presentation on sustainability. Northwestern’s Sustainability Council presented its first Strategic Sustainability Plan during Faculty Senate Wednesday. 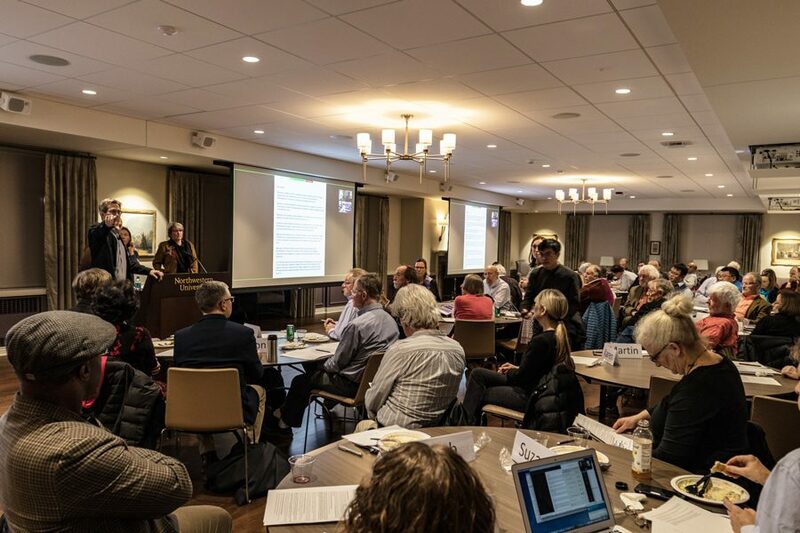 A sustainability council presented its first Strategic Sustainability Plan and outlined a set of environmental objectives and strategies to Faculty Senate Wednesday. The University released the plan in October after years of work, said Bradley Sageman, a co-chair of the sustainability council. Sageman said the council created “working groups” to tackle several objectives, such as transportation and resource conservation. The plan sets a wide range of goals, such as reducing greenhouse gas emissions and developing sustainable transportation technology, said Kathia Benitez, director of sustainability for NU. Benitez said incorporating many constituents allowed the plan to receive “bottom-up support.” The working groups totaled 250 members and developed 50 objectives, she said. A large part of the process included auditing the campus’ sustainability efforts so the group could recommend changes, Benitez said. “Our focus is to lessen the carbon footprint that is being emitted from those spaces, which is primarily our buildings,” Benitez said. The committee’s resulting recommendation is to achieve zero net emissions by 2050. To do so, the committee is planning on adding solar panels to buildings and doubling electric car charging stations, Benitez said. Though the goal of zero net emissions is “aspirational,” Benitez said, the University has already reduced net greenhouse gas emissions by 13 percent since 2012. Feinberg Prof. Lois Hedman, a faculty senator, told The Daily she approved of the plan. The University has already been recognized for its sustainability efforts — Kresge Hall was certified as LEED Platinum in September, and the University received its first ranking from the Association for the Advancement of Sustainability in Higher Education as a STARS Silver institution, Benitez said. Future sustainability initiatives will also adhere to a more eco-friendly set of requirements. Faculty Senate also voted to send a resolution calling upon the University to bargain with the non-tenure eligible faculty union to committee for further evaluation and review. The union was certified by the National Labor Relations Board in May after a disputed election in July 2016. The University appealed the decision and maintains that it will not negotiate until all ballots are counted. Associated Student Government senators passed a resolution in October similar to the one Faculty Senate sent to committee.